55 000 quality branded products. You will also collect 0.75% back in rewards points on the value of your rewards points redeemed on general merchandise using your Business Rewards Card. *IMPORTANT NOTE: The option to part-pay using a credit or cheque card is not available for online purchases at Makro. 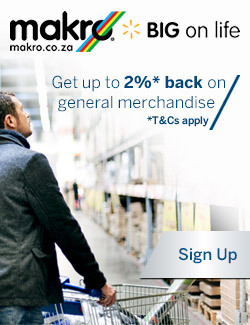 If you want to redeem your rewards points at Makro online, you will need to have enough rewards points available to cover the total purchase price of an item. To view your rewards point balance, log onto your UCount Rewards profile or call the UCount Rewards Contact Centre on 0860 UCOUNT (82 68 68) or just SMS the word ‘BALANCE’ to 32700. SMS costs R1. General merchandise excludes food, groceries, liquor, cellular, delivery charges, financial services (such as extended warranties), trade debtors account payments and gift cards. The Rand value of rewards points that can be collected at Makro will be limited to 5000 rewards points (R500) per fixed cycle, which runs from the 16th of the month to the 15th of the following month. You must have a Makro access card in order to transact at Makro. Your rewards points cannot be refunded back into your Business Rewards Card if you return goods that were purchased with your rewards points – you will be refunded with a Makro credit note (not redeemable for cash), or according to Makro’s return policy. Rewards points can only be redeemed at South African Makro stores and online at Makro. Makro does not accept debit cards for online payment.